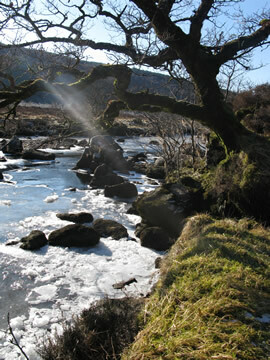 The Strontian and Carnoch rivers flow into the east end of Loch Sunart, one of the most picturesque parts of Lochaber. The area has in recent times been heavily utilised by fish farms, at one time supporting 9 separate farms. These have now consolidated into three farms, and moved away from the head of the loch. 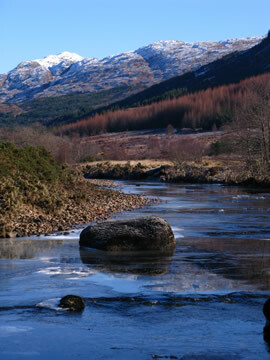 The Strontian River is designated as a SSSI because it is a fine example of an oligotrophic river. It runs through the stunning Atlantic Oak Woodlands of Ariundle NNR and Sunart Oakwoods before reaching Loch Sunart at the village of Strontian. Adult salmon returns have declined dramatically in the last few decades to extremely low numbers. 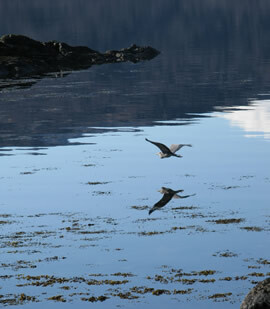 The Strontian Community Company bought the fishing rights to the river in 2006 and has worked with the Trust on a restoration Plan for the river. We are now hoping that this, along with the re-siting of fish farms will improve salmonid numbers in this river. The Carnoch runs along Glen Tarbet, between Loch Linnhe and Loch Sunart. The river has a small salmon and sea trout run. A hydroelectric scheme is currently being developed on two burns flowing into the Carnoch.